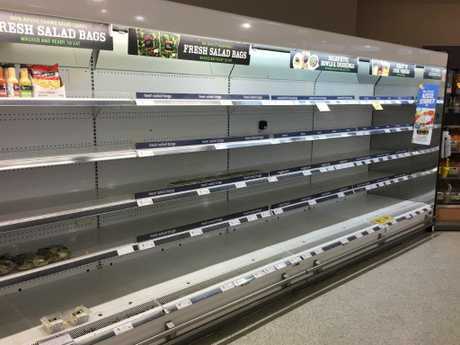 Thousands of Queenslanders aren't just facing the prospect of returning home to flooded houses, they're also worried about going hungry after supermarkets continue to struggle to get supplies in to refill stripped shelves. 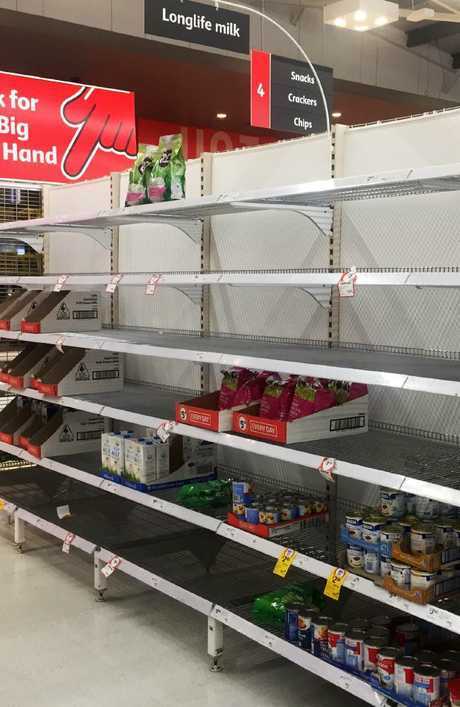 Coles, Woolworths and all other major supermarkets were unable to keep up with the demand of Queenslanders stocking up as authorities warned thousands heavy rain and the risk of flooding could last for more than a week. Despite the worrying photos, Woolworths and Coles have been working around the clock to secure supplies for the flooded regions. A plane filled with Coles' groceries is also due to touch down in Cairns later today with some of the supplies being driven down to Townsville. The Bruce Highway between Cairns and Townsville was recently reopened however locals are being warned there is still water over the road. "Yesterday Coles chartered a plane to deliver fresh produce, groceries and bakery flour to flood-affected Townsville and Cairns stores," a Coles spokeswoman said. Woolworths is also working hard to get food into the region, securing a barge and filling it with 300 tonnes of groceries while also chartering two planes. "While the road access up north has been challenging, we've secured a barge to deliver 300 tonnes of fresh food, nappies, baby formula and other essential items," Woolworths Northern Queensland operations manager Tina Anandji said. Two charter planes with 40 tonnes of fresh food and essentials will also land in Cairns today. 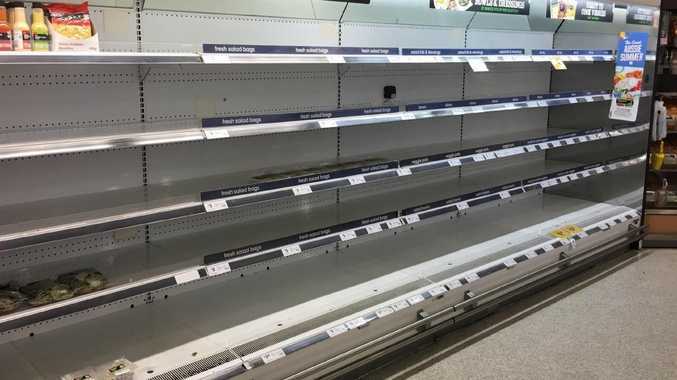 Almost a fortnight of flooding made it difficult for supermarkets to keep shelves full and it's left Queenslanders frantically looking for food. 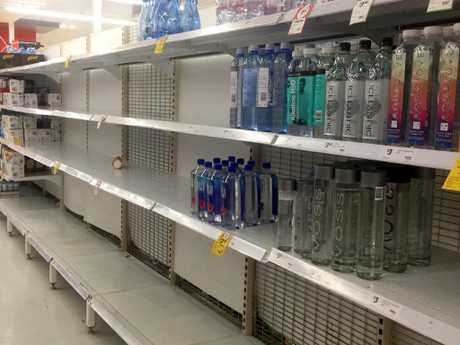 Panicked locals in the north of the state have bought out entire supermarkets over the past few days with photos showing the true extent of the problem. 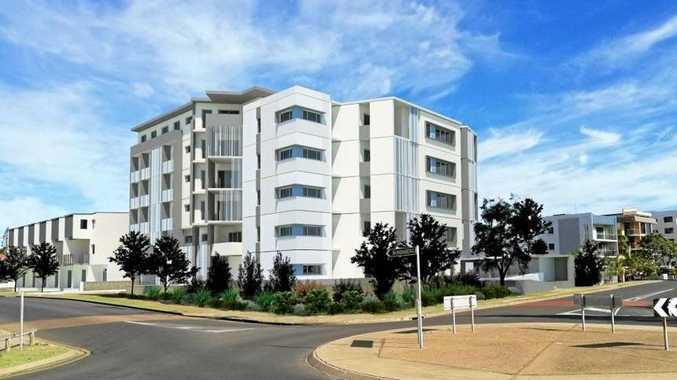 "The shops in Townsville are insane, literally can't get so many things from any stores, insane," a local wrote. Despite some residents on the coast worried about floodwaters, other regions were relishing the rain. McKinlay Shire Mayor Belinda Murphy said trucks from Coles and Woolworths stranded there by floodwaters had helped locals stock up on supplies. "A week ago, you would have been standing in a paddock full of dust and a week later, you're surrounded by floodwaters," she said.